You’ve seen the email reminders. You’ve spotted the social media talk from Facebook to Twitter's #cm12 to #chimarathon to whatever else gets the word out about the 2012 Bank of America Chicago Marathon. But if it hasn’t been emblazoned into your brain yet, or you need one more nudge to mark it on your calendar, commit to a race and get off the couch to train, here it is. Registration for this Chicago classic, to be held Sunday, October 7, opens today at 12 p.m.
Not sure if you’re ready to pull the trigger and race through the starting gates when registration opens? Run your eyes across these figures for more details about this Windy City marathon that either spur you to sign up or make you run for the rafters. I’m going with the former—you’d think that after 12 years of running, I wouldn’t need the nudge for No. 13, but I do. Dangling a hospitality ticket in front of me at Tuesday’s special launch event wasn’t enough to do it, but maybe this is. 45,000: The number of racers the event is capped at before it closes to general registration (you can usually still get in should you opt to race and fundraise on a charity team). 150: The cost in U.S. dollars for the 2012 race, if you’re located in the U.S. It’s $175 for international runners. 12: The time of day, noon, on February 1, that registration opens, unless you were so lucky to attend last night’s registration launch event. 35: This year will mark the 35th running of the Chicago Marathon. 29: The number of "official" neighborhoods traversed over the 26.2-mile course. 31: The days it took for the 2011 race to fill to capacity. 10,000: Runners who ran on behalf of a charity at the 2011 race. 248: Days until October 7 when all these runners take to the streets of the Windy City. 1.7 million: The approximate number of spectators the marathon draws. 64: Degrees Fahrenheit at the start of last year’s race. One draw to running Chicago is supposed to be cooler temperatures—October, Midwest, it should be pants and jackets weather—except it doesn’t always happen. 3,078: Runners who qualified for the Boston Marathon on the Chicago course last year, living up to its flat and fast label (according to results published at marathonguide.com). 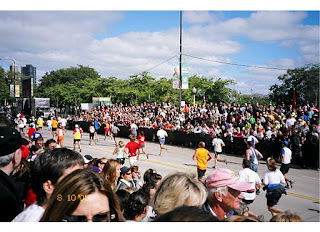 With that said, who's planning to cross the Chicago Marathon off the race list, or the bucket list or the goal list in 2012? Three, two, one, go register! Photo courtesy of Susan Bongiovanni.